I realize that technically tomorrow is the end of fall, but seeing as some crazy people think the world's going to end then, I figured I'd get this done now. I added CTV Edmonton Weather as a sixth weather forecaster. Their system is a little bit different from the other five forecasters in the analysis so far; they only give probability of precipitation numbers up to four days in the future, but do a much longer range of temperature predictions. 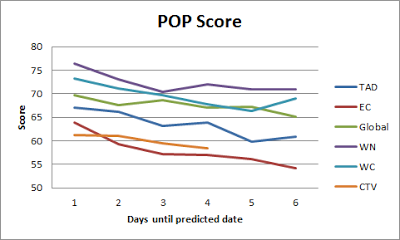 As a result their total score is only directly comparable to other stations for four out of six of the days predicted, as comparing a number to a rainy cloud icon isn't very fair statistically. 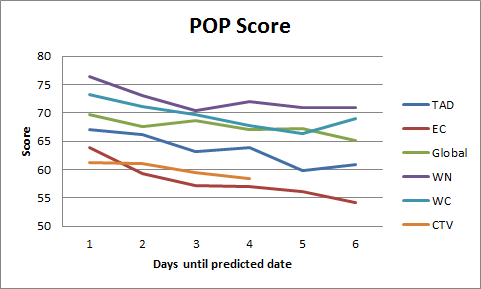 I changed the way POP scores are calculated. 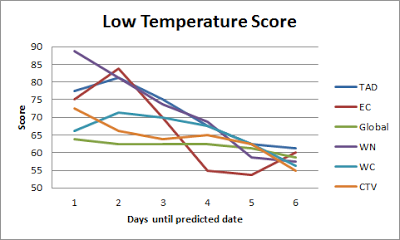 Previously I used a weird system that was more-or-less based on p-scores, but as soon as a station predicts 0% and it rains, or vice versa, their scores are shot. The new system is based on the Brier Score (a system that other people made up and actually use). 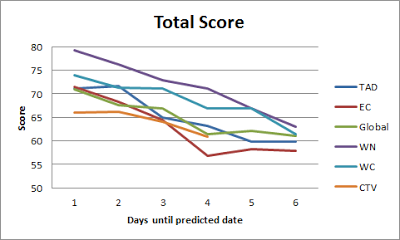 In this case, a 0% prediction with rain still gives a score of 0, but it's averaged against other scores. Unfortunately for CTV, their score is a artificially lowered compared to everyone else due to the lack of precipitation forecast on the last two days. 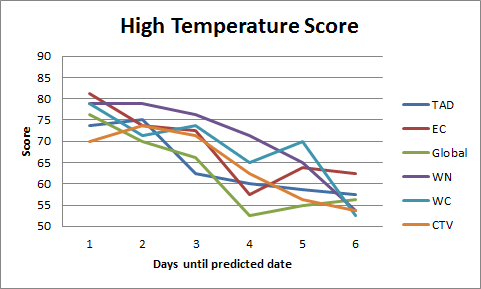 It isn't that significant of a penalty, though, as the 5th and 6th day forecasts are weighted the least. If we ignore them and only consider four days, their weighted score would become 65.18, much closer to the others. 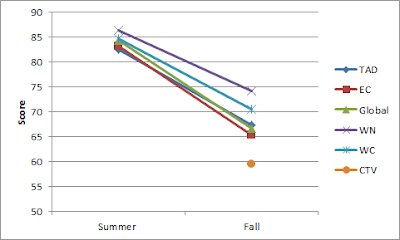 Not only do all forecasters do worse during the fall, but they also become less consistent with each other. Again, CTV scores are only directly compared to the others for four days. 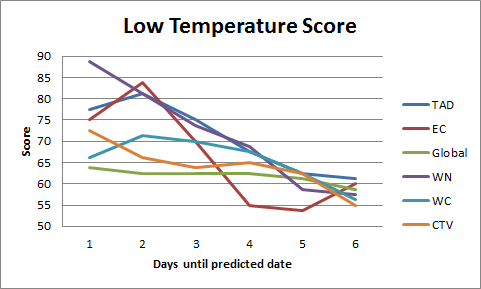 What's cool to see is that almost all of the stations consistently lose accuracy the farther into the future they try to predict - which, of course, makes intuitive sense. If you're interested in more of a breakdown of how these scores were developed, you can check out these other graphs. See ya at the end of winter! My brother is a meteorologist. I often see him working with Weather Measuring Instruments but as I am monitoring,it seems that work became easier because of new inventions and necessary modifications in meters or instruments.